So why is Marmite considered a super food? What is it made of? Where is it available? And how do you serve it? Obviously, living in the USA where it is not easily available, I’ve had to find out and so I can speak to you with absolute expertise on where you can find Marmite. Also, because I am gluten intolerant, I can’t eat it with toast so I’ve found other ways… Generations of South Africans (and other nations) have grown up on Marmite and toast as a daily staple. I’m going to provide you with a recipe for chickpea flat bread which, when served with Marmite immediately out of the oven is the most amazing delicious treat you can think of – especially for breakfast! 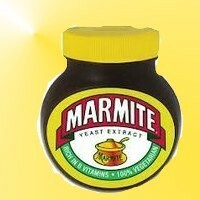 So read on about the new super food – Marmite! Marmite is made by adding salt to yeast and yeast, of course is a byproduct of brewing beer. Nobody has the exact recipe, and there have been attempts to imitate it like Vegemite. However, vegemite just doesn’t taste like Marmite – not even close! Marmite started being produced at the end of the 19th century and, well, it was certainly a staple in South Africa in the 50s when I was growing up. So I guess it’s been around a very long time. Why Marmite is Good for You and What the Scientists Say! I grew up being told that Marmite consisted of B vitamins as does yeast. Specifically, Marmite comprises loads of Niacin (another name for Vitamin B3). So why is Vitamin B3 so special? Well, it fights staphylococcus – not a very nice bacteria. Niacin also increases the strength of our immune system by producing a substance called neutrophils. This substance, I have read, increases the immune system by a 1000 times. And all this from Marmite. That said, I don’t eat Marmite because it increases the effectiveness of my immune system. I just eat it because it adds the delicious factor to my flat bread with very few calories. As all cooks know, after you’ve made something a dozen times, you don’t even think of ingredients, you just pour the stuff into a bowl and develop a feel for it. So I had to go back to my original recipe to get it exactly right. That said, it’s flexible and you’ll learn that if you put a little less chickpea flour in and a little more water and add olives or pumpkin seeds, it doesn’t alter the tastiness! 3 tablespoons for the flat bread (however, I use two to cut the calores). Chopped fresh Rosemary (as much or little as you like) I love the Rosemary in this recipe. I buy it fresh from Trader Joes. So now you mix all the ingredients together. Here’s how I do it. If I have anything else I want to add like chopped olives, etc. I add them. However, before you get this adventurous, just make the plain version first. Grease the pan both on the bottom and at the sides. Pop the future flat bread into the oven and let bake for about forty minutes. Marmite yeast extract, 4.4 ounce jars (pack of 6) is delicious when spread thinly on toast or for a treat try on a crispbread with cottage cheese. Good source of B vitamins. You can buy Marmite at Whole Foods, World Market, and recently I found it at Bed, Bath, and Beyond. It sells for about $5 or $6 for a small jar. There might be other places available but I don't know about them. I will tell you this: I prefer the bigger bottles which are available on Amazon. For some reason, the stores don't sell the larger bottles. Incidentally, you also get better prices through Amazon, but you'll have to look around if none of the above stores are available in your area. Its high niacin content could help fight superbugs - but American scientists warn too much Marmite might not be a good thing. The product that was to become Marmite was invented in the late 19th century when German scientist Justus von Liebig discovered that brewer's yeast could be concentrated, bottled and eaten.] In 1902 the Marmite Food Extract Company was formed in Burton upon Trent, Staffordshire, England by the Gilmour family, with Marmite as its main product and Burton as the site of the first factory. This concentrated yeast extract paste is 100% vegetarian and gluten free, with no added fat, salt or sugar. Marmite is an excellent source of Vitamin B12, Riboflavin, Niacin and Folic Acid (every 8,5 g serving of Marmite provides 55% of the RDA of Folic Acid) which is good news for pregnant women. The product name may have been derived from a famous French soup, petite marmite. No other foodstuff has provoked quite as much heated discussion as Marmite. Loved or hated, no-one is legally allowed to have an apathetic reaction to the savoury spread. Other than the extremely passionate reactions we have towards it, not a lot else is known about the mysterious substance. Until now, of course... The Marmite that you'd find in New Zealand has high levels of potassium, tastes weaker and is less tangy. Best Breakfast and Tea Time Snack Ever! So here’s the thing. You do not take a whole dollop of Marmite the way you would with peanut butter or something. You put the thinnest of thin spread on each. First you put butter on either the warm toast or the warm chickpea flat bread, and then you take just a touch of Marmite and you spread it. Best make two or three slices, get your favorite coffee and/or tea, sit back, and enjoy! Interesting, I had never heard of marmite before. Maybe I'll give it a try. I have heard that vegemite is TERRIBLE tasting. Whether you want to go on safari, view sharks in a feeding frenzy, climb Table Mountain, watch Zulus doing the gumboot dance or stroll gorgeous beaches South Africa is it!